For any two distinct points, there is a unique line on which they both lie. 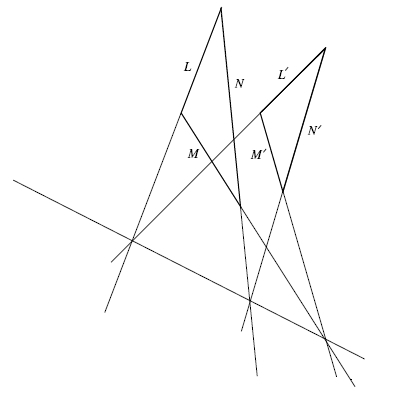 For any two distinct lines, there is a unique point which lies on both of them. There exist four points, no three of which lie on the same line. There exist four lines, no three of which have the same point lying on them. A structure satisfying these axioms is called a projective plane. Part of the charm of this definition is that it is 'self-dual': if we switch the words 'point' and 'line' and switch who lies on whom, it stays the same. There are also other points in , the 'points at infinity', corresponding to lines through the origin in that do not intersect the plane . For example, any point on the horizon in the above picture determines a point at infinity. For any two distinct points , there is a unique line on which they both lie. For any line, there are at least three points lying on this line. If are distinct points and there is a point lying on both and , then there is a point lying on both and . Given a projective space and a set of points in this space, we define the span of to be the smallest set of points containing such that if and lie in , so do all points on the line . The dimension of a projective space is defined to be one less than the minimal cardinality of a set that spans the whole space. The reader may enjoy showing that a 2-dimensional projective space is the same thing as a projective plane . where are elements such that implies . This axiom holds automatically for projective spaces of dimension 3 or more, but not for projective planes. A projective plane satisfying this axiom is called Desarguesian. 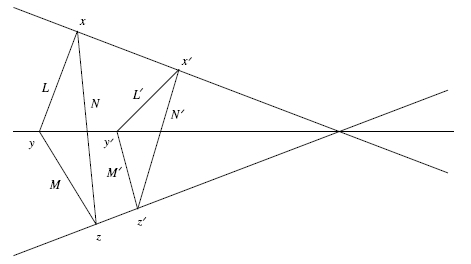 The axiom of Desargues is pretty, but what is its connection to skew fields? 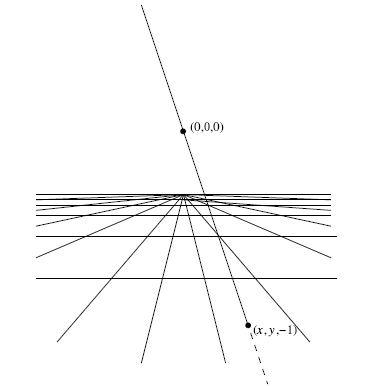 Suppose we start with a projective plane and try to reconstruct a skew field from it. We can choose any line , choose three distinct points on this line, call them , and , and set . Copying geometric constructions that work when , we can define addition and multiplication of points in . In general the resulting structure will not be a skew field. Even worse, it will depend in a nontrivial way on the choices made. However, if we assume the axiom of Desargues, these problems go away. We thus obtain a one-to-one correspondence between isomorphism classes of skew fields and isomorphism classes of Desarguesian projective planes. Projective geometry was very fashionable in the 1800s, with such worthies as Poncelet, Brianchon, Steiner and von Staudt making important contributions. Later it was overshadowed by other forms of geometry. However, work on the subject continued, and in 1933 Ruth Moufang constructed a remarkable example of a non-Desarguesian projective plane using the octonions . As we shall see, this projective plane deserves the name . for all elements and . Any commutative algebra satisfying this identity is called a Jordan algebra. Jordan algebras are automatically power-associative. In 1934, Jordan published a paper with von Neumann and Wigner classifying all formally real Jordan algebras . The classification is nice and succinct. An ideal in the Jordan algebra is a subspace such that implies for all . A Jordan algebra is simple if its only ideals are and itself. Every formally real Jordan algebra is a direct sum of simple ones. The simple formally real Jordan algebras consist of 4 infinite families and one exception. The algebra with the product . Here we say a square matrix with entries in the -algebra is hermitian if it equals its conjugate transpose, and we let stand for the hermitian matrices with entries in . Jordan algebras in the fourth family are called spin factors, while is called the exceptional Jordan algebra. This classification raises some obvious questions. Why does nature prefer the Jordan algebras over all the rest? Or does it? Could the other Jordan algebras — even the exceptional one — have some role to play in quantum physics? Despite much research, these questions remain unanswered to this day. The paper by Jordan, von Neumann and Wigner appears to have been uninfluenced by Moufang's discovery of , but in fact they are related. A projection in a formally real Jordan algebra is defined to be an element with . In the familiar case of , these correspond to hermitian matrices with eigenvalues and , so they are used to describe observables that assume only two values — e.g., 'true' and 'false'. This suggests treating projections in a formally real Jordan algebra as propositions in a kind of 'quantum logic'. The partial order helps us do this: given projections and , we say that 'implies' if . has length . In fact, we can use this to define the rank of a projection in any formally real Jordan algebra. We can then try to construct a projective space whose points are the rank-1 projections and whose lines are the rank-2 projections, with the relation of 'lying on' given by the partial order . If we try this starting with , or , we succeed when , and we obtain the projective spaces , and , respectively. If we try this starting with the spin factor we succeed when , and obtain a series of 1-dimensional projective spaces related to Lorentzian geometry. Finally, in 1949 Jordan  discovered that if we try this construction starting with the exceptional Jordan algebra, we get the projective plane discovered by Moufang: . In what follows we describe the octonionic projective plane and exceptional Jordan algebra in more detail. But first let us consider the octonionic projective line, and the Jordan algebra .